West Bloomfield has a lot to offer Michiganers who are looking for an outside-the-box kind of adventure. Of course, we are referring to our very own adventure park in TreeRunner West Bloomfield Adventure Park, located at 6600 West Maple Road, West Bloomfield Township, Michigan, 48322. You can find us behind the Jewish Community Center at the crossroads of Drake Road and 15 Mile (Maple Road). We are proud to host one of only a few aerial adventure parks you can find across this great nation. Our treetop adventure park in West Bloomfield features 130 obstacles and zip-lines, three different difficulty levels, and seven different courses — which means you won’t run out of activities quickly! What’s more, we offer a Junior Park; an aerial adventure park specifically designed for children ages four through seven! If you aren’t familiar with aerial adventure courses to any degree, we’d encourage you to take the opportunity to browse our website to get a feel for what we are all about! Ideal for solo parties, birthday parties, school & camp outings, youth groups, scouts, sports teams, corporate outings, team-building events, or just your immediate family, we are confident that almost everyone, young and old, will find something they enjoy at TreeRunner Bloomfield Adventure Park! Whether you are interested in planning a team-building activity for your staff or you’d like to connect with your family in a fresh way, our zip-line adventure park is an amazing chance to create new memories while experiencing the outdoors and having fun high above the ground among the trees! As the title of today’s blog might have led you to infer, today we will discuss the benefits of outdoor team-building activities. Generally, there is a lot to be said about conquering the “obstacles” (both figurative and literal, in our case) you face as a team. 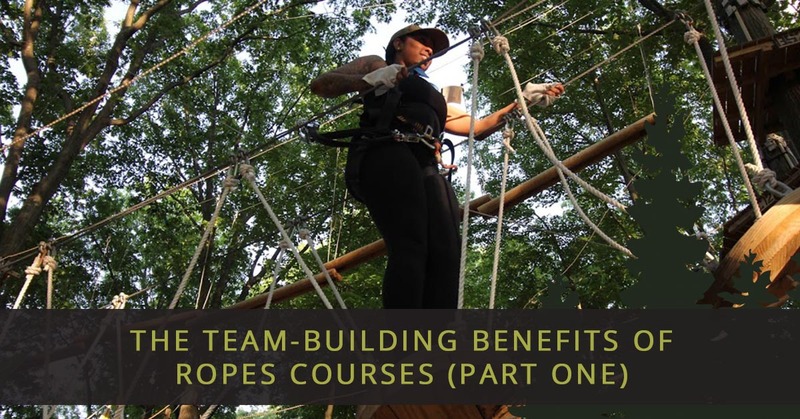 But we’ll also take a look at the historical context of team-building through completing ropes courses, in particular. And before you raise an eyebrow about just how specific that last point is, we ask you to continue reading! You just might be surprised, entertained, and educated as to how you can help your team to grow in unity! Keep reading if that sounds like something you are interested in! Why Team-Build In The First Place? Let’s start with some fundamentals. If you have a team, it means you are all working together to some sort of goal. If that goal is in the professional, business-oriented context, great! If it’s a recreational sports team, awesome! If it’s a church youth group’s leadership team, all the better! The point is that, whatever kind of team you have, you are all working toward a common goal in one way or another. When your team’s members aren’t on the same page, perhaps because they don’t feel connected or like they can trust one another, you are going to have a much more difficult time accomplishing your goals than you might otherwise. This is why team-development is an integral piece of building your team’s unity and efficacy. While no two teams are alike in personnel or particular goals, there is plenty to be gained from learning how to coordinate with one another in terms of leaders and members. The fact remains, however, that growing a bond within a team takes time. When you have coworkers who have worked together for years, they typically understand each other’s style and intent. Put another way, they know that they have one another’s backs. But again, this takes time and experience. So what can be done to accelerate this process, given that your team needs to reach their goals in the present, rather than five years down the road? Establish a new context to help these bonds grow more quickly. You want people to (safely) be alert, emotionally present, and, most importantly, to need each other. The best example that comes to our mind? You guessed it! An aerial adventure park, complete with ropes courses, obstacles, and zip-lines! It has all your bases covered. As it turns out, we feel the need to turn this into a good old-fashioned two-parter. Now that we’ve established a context for why outdoor team-building activities are so important, we’d like to dive into the details a bit more in part two. And remember, we’ve got options for groups of all kinds and ages. We offer a totally unique way of enjoying while challenging yourself and your team. We make the entire experience safe and fun for the whole crew! So be on the lookout for that post in the near future, and in the meantime, book your treetop adventure in West Bloomfield at your convenience! We’d love to host you soon!